Milapfest’s SAMYO & TARANG National Ensembles have a reputation for rich, innovative and adventurous music, rooted in the Indian Classical tradition. This exciting compilation features some of the best examples of their original productions, from both showcase performances and tours, as well as a series of previously unpublished tracks. 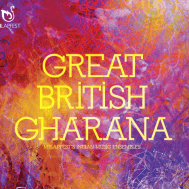 This is the first in a series of ‘Great British Gharana’ (GBG) albums and accompanying books showcasing the collective talents and stories of Indian Classical music-making in Britain in the 21st century, which is characterised by innovation in tradition, and the search for a new musical identity.